American Brooks Koepka has won back-to-back US Open titles with a one-stroke victory over England’s Tommy Fleetwood at Shinnecock Hills in New York. 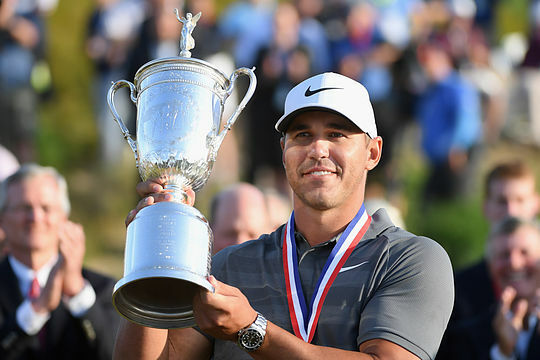 Koepka finished at 1-over-par for the championship with rounds of 75-66-72-68 and becomes the 7th player in US Open history to win back-to-back titles, the last being Curtis Strange in 1989. Fleetwood earlier had the opportunity to become the first golfer in history to score a 62 at the US Open, which would have also stood as the lowest score at any major played in America. Standing over a short putt on the 18th the ball slid by and Fleetwood went onto card a 7-under 63 to finish at 2-over-par in outright second. Fleetwood broke the long-standing Shinnecock Hills Golf Club record of 65. He’s one of just six golfers to ever score 63 at the US Open and the fact he made 13 out of 14 fairways was a major factor in his superb final round. “I honestly never really thought I was out of it. I just needed a good start. You never know what’s going to happen,” said Fleetwood. Fleetwood’s score of 2-over flirted with the day’s leaders as Koepka, Johnson and Finau battled over the back nine. Koepka kept his composure when in trouble, no more so than on the 12th where he made a delicate up-and-down after finding the rough with his drive to save par after making a bogey on 11. A birdie chance on 13th to give Koepka a two stroke margin with five to play, never had a chance leaving the reigning champion with a tricky two metre putt to save par. His drive on the 14th found the right side fairway rough but again Koepka dug deep to make par. A birdie on 16 gave Koepka a two stroke lead over Fleetwood and a three shot advantage over Johnson, Reed and Tony Finau. After Koepka made par on 17, he headed down the 18th with a two stroke advantage over Fleetwood. A shaky approach that hit the left grandstand leaving the ball short sided and above the hole. Koepka needed to get down in two from there to prevent a possible playoff with Fleetwood, which he did in style. “It [two-time US Open champion] sounds incredible. To be honest with you, probably couldn’t have dreamed of it in my wildest dreams. I’m at a loss for words right now, but it’s really incredible. I mean, I couldn’t be happier. We grinded our tail off this week to come back from 7-over and do what we did. It was pretty special,” said Koepka. Johnson fought hard after opening with a 1-under 34 and continued to find fairways averaging 83% of fairways hit but was again let down by his putter – particularly on 11,14 and 17. He would finish in 3rd position at 3-over-par, a shot ahead of Patrick Reed. Two Australians made the weekend with Aaron Baddeley finishing the best at 12-over and in a share of 25th position. Marc Leishman had his chances this week entering the weekend just five off the leaders but a 78 on Saturday hurt his chances and he finished with a 74 today for a total of 15-over and in a share of 45th. Jason Scrivener narrowly missed the 8-over-par cut, to be at 9-over-par, Matthew Jones finished at 10-over-par, Cameron Smith at 11-over-par. Jason Day fired rounds of 79-73 for a 12-over-par total, with Adam Scott at 13-over-par with rounds of 78-75 along with David Bransdon who opened with a 79-74. Lucas Herbert rounded out the Australians finishing at 17-over-par.